Henning Mankell, the “star” of the Swedish crime novel, was to be the guest of honor at the Book Festival of Aix en Provence from the 9th to the 11th October and to dialogue with several writers and especially Qiu Xiaolong. The death of Henning Mankel on October 5th was a blow to this Aix Book Fair, organized by the association “Crossed Writings” under the guidance of Annie Terrier. A book Festival which, with the University of Aix-Marseille, for many years, has made Aix en Provence known to a number of great writers including Mo Yan and Gao Xingjian. A fascinating debate between two crime novel authors did not take place, but recalling the works and the character of Mankell by the participants moved a large audience. Mankell was interested in modern China, including its policy towards Africa with “The Man from Beijing” (2008) (1). Qiu Xiaolong like Mankell are novelists for whom the historical perspective, sociological, political, is at least as important as the detective story plot. Qiu Xiaolong’s interest for the Swedish detective novel is not new; he mentioned the influence of Sjöwall and Wahlöö (1926-1975) including their Roseanna novel (2). These writers, who married in 1962, wrote between 1965 and 1975 ten crime novels with Inspector Martin Beck, a somewhat different character from the hero of Mankell, Kurt Wallander. Sjöwall and Wahlöö took a very critical approach to the Social Democratic Swedish society highlighting the negative aspects of a model popular and respected at the time in Europe. They also make us live the life of police officers, the development of investigations with the patience and persistence which is needed. These two heroes are quite depressed, Wallander has been abandoned by his wife and Martin Beck eventually divorced. They do not inspire like Chen Cao joy of living; poetry is not their cup of tea even if Wallander is an opera fan. As for the food, often a major concern for Qiu Xiaolong, it is not their problem; you have to eat, that’s all … and they drink too much. 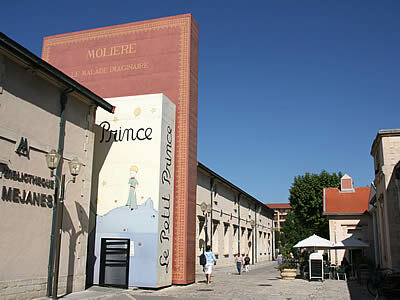 An interview at the “City of Books” in Aix en Provence. One hour meeting allowed Qiu Xiaolong, after a presentation to answer my questions and those of the public; a meeting followed by numerous book signatures and informal discussions. 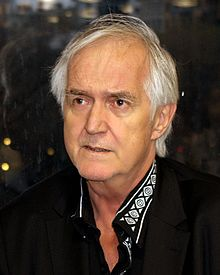 You are not an activist like Henning Mankell, but do you think that your novels are political? Certainly, it’s easier for me, who lives in the United States, to comment on Chinese politics but I prefer to do it in my books rather than being directly involved. As you know, my family and I have suffered from the Cultural Revolution. Our house was looted by the Red Guards and my father was persecuted; I had, at thirteen, to write his self-criticism because he had just been operated from the eyes. This is also my first literary success because the criticism was accepted without reservations! The Cultural Revolution was such a disaster that no one can imagine that there will be another one, but during the Bo Xilai case, the Prime Minister at the time, Wang Jiabao, stressed that the action of Bo Xilai (4) was connected with this “tradition” with “red” songs and manipulation techniques. Bo Xilai is in prison but the “red songs “, censorship and internet control are still in place! Do you think that the fight against corruption, the fight against pollution are real priorities for the government or means to reinforce power? Probably both. The Party understood that corruption has led people to lose confidence in the government. On the internet, people laugh openly about the fight against corruption. They must do something but also eliminate political enemies; this is part of the single party system and of the lack of transparency and of independent media. Pollution is a serious problem much talked about. With a single party system, who is responsible? The Party of course. That’s why I wrote a book on the pollution of Lake Tai (5). Recently a TV reporter, Chai Jing, has financed herself a documentary on pollution in China, “Under the Dome”; one hundred million Internet users have seen this movie but censorship has quickly blocked it. I have just published a short story on the subject. In response to one of my questions, a few years ago, you have stressed that positive developments of the Chinese system meant that the Mao case is solved. Mao’s shadow is always there. You see it in the political speeches, propaganda, the Party … Recently the topic of a debate was about to find out what was most important, the legal system or the Party. Response, the legal system must serve the Party … In literature, it is the same thing, but it is not said openly that literature must serve politics! At the same time censorship is there and my books suffered numerous cuts and Shanghai was renamed “City H” in the Chinese edition! A reader asks if Qiu Xiaolong can visit China? Yes I did not have the same problems as Ha Jin who was unable to visit his mother at the end of her life. I can go to China; maybe my Western readers who go to Shanghai with my books as a guide are a commercial … protection. 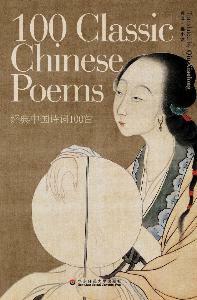 Moreover, my book “100 classic Chinese poems” that compares poems and Chinese paintings was an official book for the Shanghai Expo in 2008. But I am very careful during these visits that are important for me to keep a close contact with the Chinese reality. I wanted to deliver my next book to my French publisher, Liana Levi, who publishes my novels before the US, on the occasion of this trip. Family problems prevented me to do it. The title could be “Becoming Inspector Chen” or something like that; ie the years of Chen before he became inspector. The structure is new, and involves writing in the first, second, third person. Each chapter is a bit of an independent story, some are related to Chen, others are more autobiographical. One writer suggested that I write another judge Dee (or Ti) story; he lived (630-700) during the Tang Dynasty. But the difficulty is to write after the famous sinologist and Dutch diplomat Robert van Gulik (1910-1967) who created twenty novels inspired by that judge. But I thought that maybe Inspector Chen could be trying to solve a case of Judge Dee in today’s China. Moreover I am fascinated by one of these novels “Murderers and poets”, which is based on a woman poet who actually existed and who is judged a bit harshly because her life and her lovers did not meet the norms of the time. 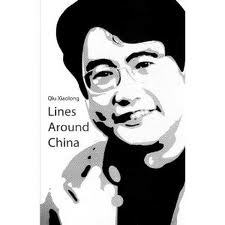 Qiu Xiaolong never neglected poetry that holds an important role in his life. Already in China, he translated TS Eliot, Yeats, Ezra Pound. In St. Louis, he was very busy with Eliot. like the debris of imagination. (1) Henning Mankell, “The Chinese,” translated from the Swedish into French by Rémi Castagne, Seuil, 2011; 560 pages, 8.20 euros. 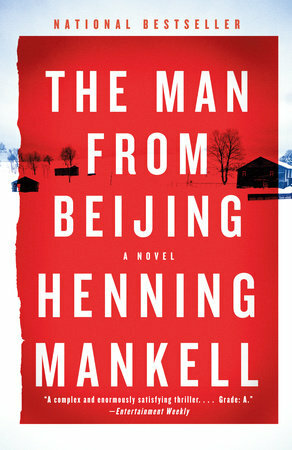 (1) Henning Mankell, “The man from Beijing”, Vintage Books, 2011. (2) Sjöwall and Wahlöö, “Roseanna”, translated into French by Michel Deutsch, foreword by Henning Mankel. Payot & Rivages, 2008, 310 pages. (2) Sjowall and Wahlöö, “Roseanna”, Vintage crime, september 2008, 224 pages. (3) Qiu Xiaolong, “Lines around China,” Neshuipress 2008. (4) Qiu Xiaolong, “Blue Dragon, White Tiger”, translated into French by Adelaide Pralon. Editions Liana Levi, in March 2014, 304 pages, 19 euros. (4) Qiu Xiaolong, “Shanghai Redemption”, Minotaur Books, september 2015, 320 pages. (5) Qiu Xiaolong, “Treacherous currents of Tai Lake”, translated into French by Franchita Gonzalez Battle. Editions Liana Levi; March 2010; 310 pages, 19 euros. 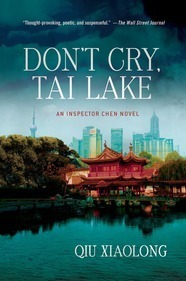 (5) Qiu Xiaolong, “Don’t cry Tai Lake”, Minotaur Books, 2013, 270 pages.